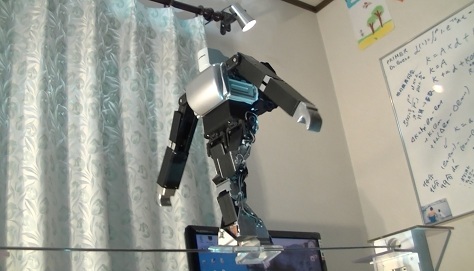 Robots-Dreams has shared an amazing video showing Primer-V4, an amazing biped robot built by Dr. Guero in Japan, walking a tightrope. This is no smoke & mirrors trick — the robot really is balancing itself, shifting its center of gravity using its arms just like a human tightrope walker. In my local robot club, we occasionally have builders of autonomous wheeled robots who scoff at humanoid robots as mere remote-controlled toys, simply playing back preprogrammed servo sequences. There’s some truth to that, at least for “simple” Level 4 or below robots. But Dr. Guero’s self-balancing, tightrope-walking, bicycle-riding robots do things no R/C toy could ever hope to do. Check out the Robots-Dreams post for more insight, as well as another video showing one of Dr. Guero’s earlier robots riding a bicycle. Dr. Guero’s blog has a lot more interesting details, too (here it is translated to English).